Dishwasher not filling? 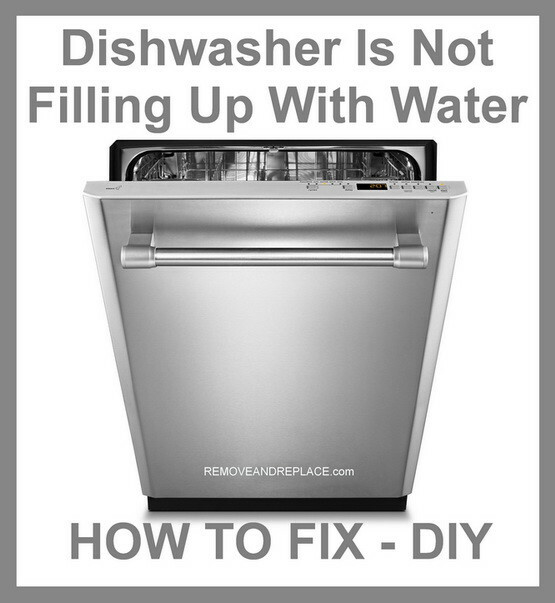 If your dishwasher will not fill with water, here are the parts you need to have a look at. You may either have a bad part or you could have an issue with the water supply going to the dishwasher. Check all the parts we list below and you will have your dishwasher fixed in no time. Do it yourself and save money! This valve fills the dishwasher with the correct amount of hot water. The water inlet valve is operated from the control board or the timer (the timer is for older dishwashers such as popular brands Maytag and Kenmore dishwashers, the control board is for newer dishwashers). The valve is behind the lower access panel at the bottom of the dishwasher. 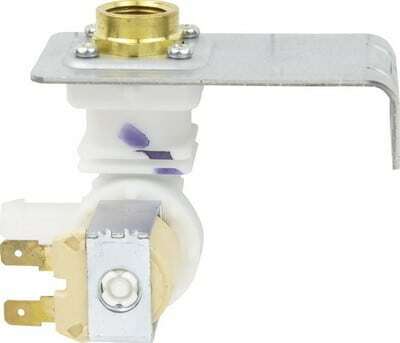 The valve has 2 wires, an outlet hose to the inner dishwasher tub, also the hot water line from your home water supply (usually the line from under the sink). First inspect the water supply to be sure there is enough water pressure going to the valve during the fill portion of the cycle. If you are getting the right water pressure, then it is possible the valve is bad. Be sure to check that the filter screen on the water inlet valve is not clogged. If clogged clean it off and retest your dishwasher. If not clogged check the valve for proper operation. To be sure test with a multimeter. If the valve is in working order then proceed to the below parts to make sure they are not causing your NO FILL issue. Be sure the water valve to the dishwasher is turned on and fully OPEN. If so then check to be sure that hard water has not clogged anything. Hard water can clog the water supply valve. There is a small filter screen in the water inlet valve. If clogged the dishwasher cannot fill. Also be sure the water pressure to the valve is correct. The valve needs at least 20psi to operate as designed. This float is at the bottom of the dishwasher tub usually front left. This float is a safety that lifts up when the water fills in your dishwasher and turns the water off before it gets too high and overfills. Make sure nothing is holding the float in the up position. It needs to be able to freely move vertically. There is a small switch inside it. 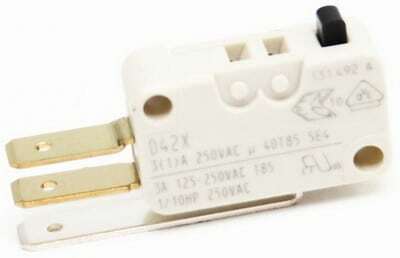 If the float moves freely then you may have a bad float switch. This switch is a small micro switch. When the float rises, it clicks the switch and the water turns off. If the switch is bad the washer will either overfill or WILL NOT FILL AT ALL. Check the float switch for continuity with a multimeter to be sure it is in working order. This switch prevents the dishwasher from washing when the door is in the open position. When the door switch is bad the dishwasher will not fill. The switch is behind the door panel at the top of the dishwasher door. Make sure the door switch is operational. To get to the switch, remove the inside door from the outside door (see YouTube videos for your dishwasher model). Locate the door switch and check it for continuity with your multimeter. If there is no continuity, then replace the dishwasher door switch. If you have problems with your dishwasher not filling with water, please leave your question below and we will be happy to assist you with fixing your dishwasher. I have a fisher and paykel dishwasher, that is showing a u1 error code, water is going in but draining away before the element starts. Here’s the deal: After fixing the wires and checking the operation of the inlet valve (it worked) cleaning everything, I was sure the DW would work again as it had. NOPE. The DW cycles through, makes a lot of noises, but there is no water coming in still. Could the injured wires have affected some other control? – Check the water inlet valve. – Be sure the water valve is fully open. – Be sure the water fill hose is not crimped or bent or clogged. 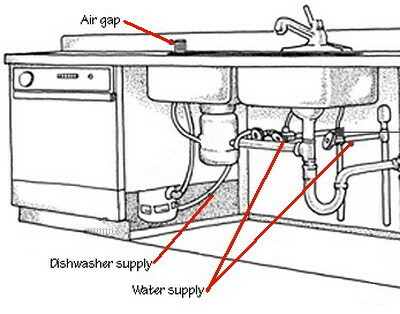 If the hose is positioned correctly, the water is on, the valve is open, the inlet valve is working properly, the water should fill the Dishwasher. Samsung DW has been worked on 3 separate times and not working in 6 weeks. Won’t drain water , won’t start, a pump is running but no water coming in. 5E error code at first but now no code and DW still is not running. Very disappointed with this DW and the response from Samsung customer service. I have just purchased a Fisher and Paykel dishwasher DW60CHX1 from Noel Leeming, have installed it correctly from the official instruction guide that came with the dishwasher. All electronics are working, water supply to dishwasher, BUT the dishwasher does not fill. As there are no actual instructions in the guide for connecting the hose to the dishwasher, is there something I should’ve done to the water connection port on the dishwasher before attaching the hose?